Ending in a few hours:MacUpdate’s Parallels Desktop 8 bundle which effectively knocks $30 off the price of Parallels 8 and then hooks you up with DEVONthink Pro and 8additional Mac applications for free (normally $618). A free demo is also available. – Parallels Desktop 8 ($79.99) – Run Windows/Linux/Chrome on your Mac. – DEVONthink Pro ($79.95) – Info manager. – Prizmo ($49.95) – OCR Scanner for editing printed documents – MacUpdate Desktop ($10.00) – Software update utility – MotionComposer ($149.00) – Design animated and interactive Web content. – 1000 OpenType fonts Collection ($99.00) – OpenType Fonts. – iStat Menus ($16.00) – Monitor your Mac from the menubar. – PhotoStyler 6 ($29.99) – Stylize your photos with filters, presets, more. – DiskAid 6 ($29.90) – File transfer tool for iOS devices. – Mac Internet Security 2013 ($29.99) – Malware/anti-virus utility. 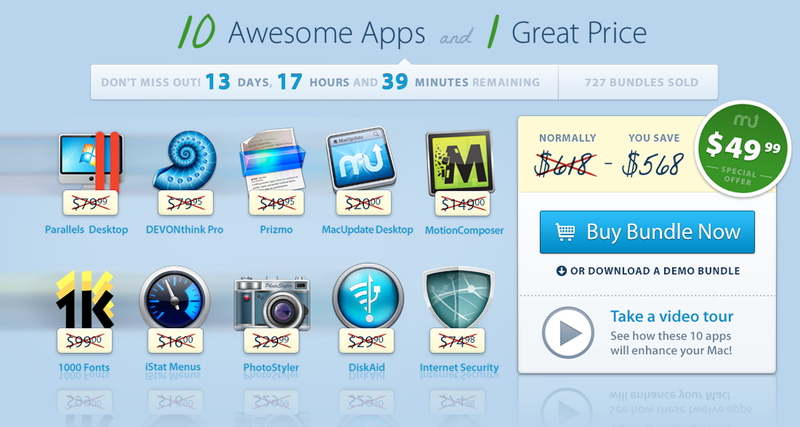 The bundle includes 10 HIGH-QUALITY Mac apps valued at over $390 for an EXCLUSIVE price of $50! This all-inclusive bundle has just about something for everyone. Roxio Toast 11 ($100) – Titanium makes it easier than ever to capture, burn, convert, copy and share digital media. Set for iWork ($69) – Over 1100 unique designs for Pages, 100 spreadsheet templates for Numbers, 50 first-class slideshow themes for Keynote, and 1300 images for illustrating your content. All templates are available in the US and international paper sizes. LaunchBar ($35) – Get instant access to applications, documents, contacts, calendars, bookmarks, media libraries, search engines and so much more – just by typing short abbreviations. TasksBox ($25) – TasksBox is a simple and beautiful task manager that helps you to easily manage your daily tasks so that you can spend more time on what you love. Animationist ($30) – Create perfect title art animations for your YouTube videos, iMovie or Final Cut projects, showcase videos and even TV broadcasts. iFinance ($30) – Start recording your income and expenses right now, be it a coffee during lunch break or a brand new car – finally, you’ll get a clear overview of what exactly you spend your money on. Habits ($20) – Habits is based on the scientifically proven principle that it takes a continuous chain or repetition of an activity to create a new habit, make a habit out of a resolution or replace an existing habit with a new one. MainMenu Pro ($10) – Run daily, weekly and monthly maintenance scripts to keep your Mac strong. Corel Paint it! ($40) – This photo painting software includes multiple painting styles, brushes and realistic effects that let you add a personal touch to any creative project. Stationery Pack 2 ($25) – Turn your favorite photos into greeting cards and send them with Mail. That’s right, if you buy this bundle RIGHT NOW, you’ll also get Trickster as an added bonus! Trickster ($10) – Trickster is the ultimate productivity booster for you. This bundle has been hand-picked to ensure that quality apps make it onto your desktop. 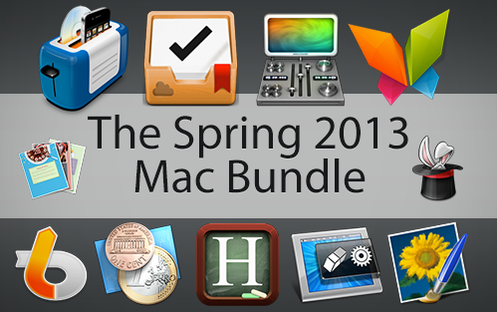 There’s no better opportunity to start enhancing your Mac that with this Spring 2013 Bundle. First up, we have MacUpdate’s Parallels Desktop 8 bundle which effectively knocks $30 off the price of Parallels 8 and then hooks you up with 9 additional Mac applications for free (normally $618). A free demo is also available.